A library is one of the last refuges for the democratic potential of a shared cultural consciousness, a true public commons. Reading takes many forms here – at times it is a very directed, instrumental pursuit of particular forms of knowledge, at other times it is more intuitive, a mental wandering, where one book leads to the next, through footnotes and bibliographies, and through browsing in the stacks. Trappings is a series of discreet interventions into the VPL print collection. They trace the research conducted by the artist for her writing, teaching, and art making. Roy researches and collects information for particular projects, such as one related to the letter X, and more recently, one related to the letter Q. More generally, her research interests include concepts such as nomadism, nature, portraiture and property. In Trappings, Roy imagines a book as a temporary location where a nomadic researcher lingers, exploring how the slips of paper, small images and notes might find another reader of the same text at different time. These subtle book interventions create new mental paths to follow, by inserting information related to the topic of the book, or by leading the reader to the other books in which she has intervened. These ephemeral messages, seemingly accidental, speak directly from one reader to another and add another voice or point of view to the published text. Thoughtfully produced, they engage the curiosity of fellow readers within the labyrinth of the collection, and may contradict or complicate the original author’s intentions. Over the course of Group Search, Trappings maps the book collection with the path of her inquiry, and shares the many pleasures to be taken in her work. 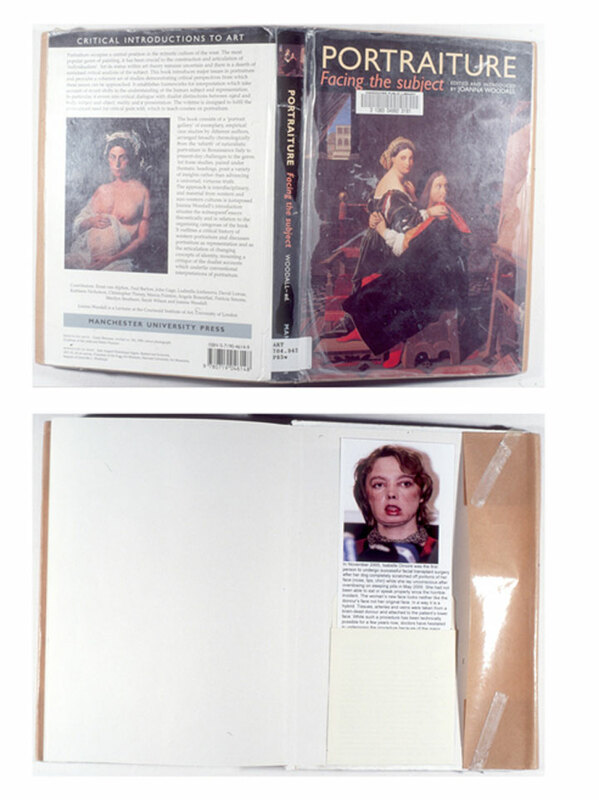 Roy documents her on-going process by noting the call number, title, and other classification data; the condition of the book, a description of what was left inside the book and/or a photograph of her intervention.